Greetings from Rabat, Morocco! We landed yesterday afternoon in Casablanca, and immediately made our way to Rabat. Our flights were uneventful. We had a 5 hour(!) layover in Paris and were surprised to see no additional security presence in the airport. It felt like just a normal Tuesday morning in any international hub. Our drive to Rabat was also fairly uneventful. Through a glitch in the GPS we started the trip on the N1 versus the more ideal A3. And what's the difference between the N1 and A3? A3 is highway, while N1 is colorful surface road. While the traffic moved fairly quickly on the N1, you've got distractions like folks herding sheep or pedestrians walking across the road, which slows everything down. Still, by some minor miracle we traversed the city at night and found our hotel. We totally cheated and ordered room service for dinner. Yet, thanks to the exchange rate our extravagant meal was all of $15.00. Try that at your next luxury hotel and tell me how that works out for you. Today was spent walking throughout Rabat and taking in its main sights. 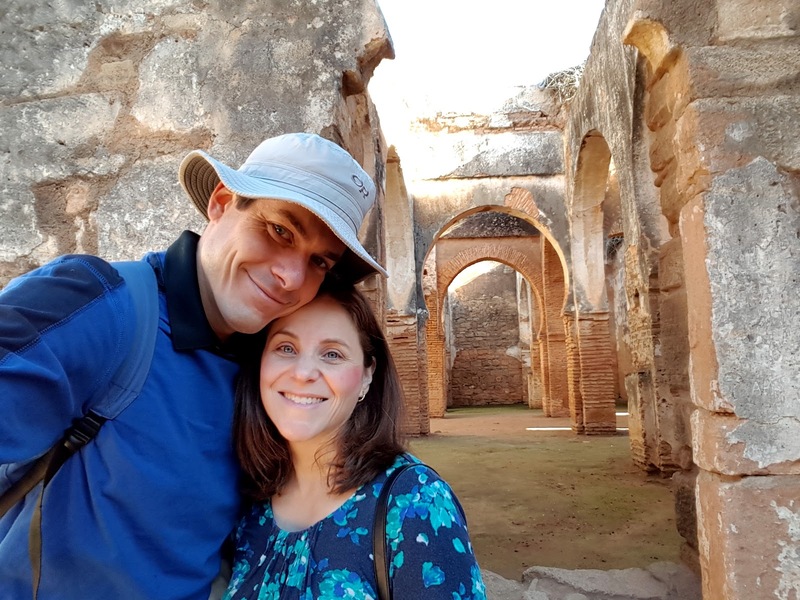 We started by touring the ruins at Chellah, an ancient city which is right next to Rabat. The only people we saw were guards and folks working on the grounds. Other than that, the site was all ours. Unlike some historic ruins, at Chellah you can get up close and personal to the whole thing. You can effectively walk among the ruins that you're admiring, rather than just observe them from a safe distance. If the remains of the city weren't enough, there's a stork population that now calls the site home, and they're equally interesting to observe. Who knew storks were so loud? They make a sort of clapping noise that is delightfully eerie. Definitely an awesome site. We hit the other main attractions in the city, including the Medina, Kasabah and the Hassan Tower (which is ensconced in scaffolding, which was a shame). Oh, and of course the museum at the Kasabah was closed, that's so typical for me. Shira got off the hook with that one. We're finding the city to be safe and welcoming. Being a pedestrian requires a certain level of boldness, as cars will yield to you in an intersection, but only after you've stepped in and started walking. I rely on a technique I first started using in Italy of simply standing with a local and crossing when they cross. I figure they must know what the heck they are doing. Another quirk of the city: like Ecuador, this appears to be a BYOTP bathroom situation. That is, Bring Your Own Toilet Paper. At Chellah, they had a couple of ladies who would provide a roll of toilet paper for a nominal fee, but in other locations, it's expected you'll have your own. Not terribly difficult to deal with, but good to know before you have to go. I have to say, I'm loving the architecture of Rabat. It's all towers and castle walls and such. My inner toddler just thinks the buildings are so cool. It's time to go find some dinner. Between Shira's high school French, and my hand gestures, how hard could that be?